Learning management systems (LMS) are the software powering online education, enabling teachers and trainers to share coursework, administer assessments, and track students' learning. There are a variety of LMSes available from proprietary vendors, but an enduring open source choice is Moodle. Moodle has been available for almost two decades. It was started by Martin Dougiamas, a Curtin University student and employee, who saw possibilities for improvements that became Moodle in 2001. As of early 2018, over 2.4 million students worldwide, from K-12 through higher education, are using Moodle. While it originally grew from Martin's vision, Moodle has a large and robust community of developers and other contributors that make the product a compelling choice over proprietary options. Moodle is at home on any Linux-based distribution, but this tutorial uses the Ubuntu 16.04 platform. Moodle also requires a web server and database server to be installed. This example uses Nginx and MariaDB, but Apache and either MySQL or Postgres also work. Just follow the prompts to set a root password and secure your installation. For public deployments, the server must be properly configured for SSL. Let's Encrypt is a good option with instructions for using it with Nginx. Now open your web browser to your newly created site either by IP address or the canonical name you gave this site. For example, if your server has the IP address of 192.168.1.20, then open your web browser to http://192.168.1.20/ and Moodle will open to the initial configuration page for your installation. 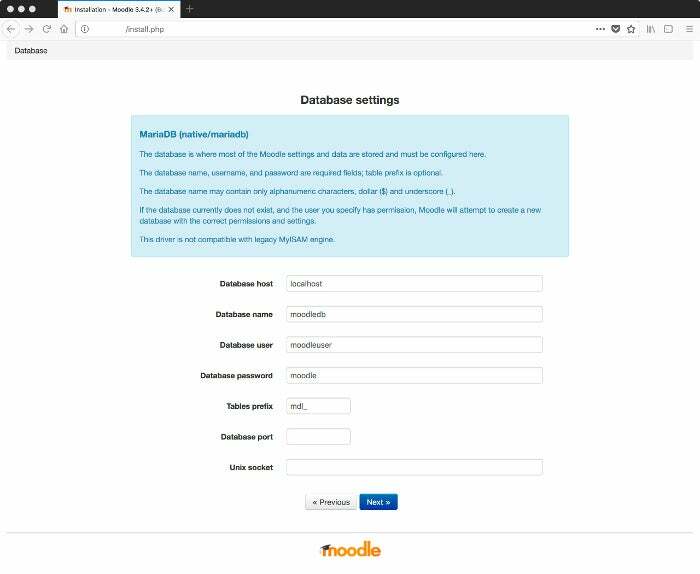 As you enter the final configuration, the Moodle installation process will configure the language options, the public address of your server (where Moodle is installed), and finally where the moodledata directory is stored. Next, Moodle will ask about the database server and tables you set up earlier. Moodle will ask you to agree to the license agreement, then do some pre-checks before creating the database tables. If there are problems, Moodle will highlight the missing item or required configuration change. 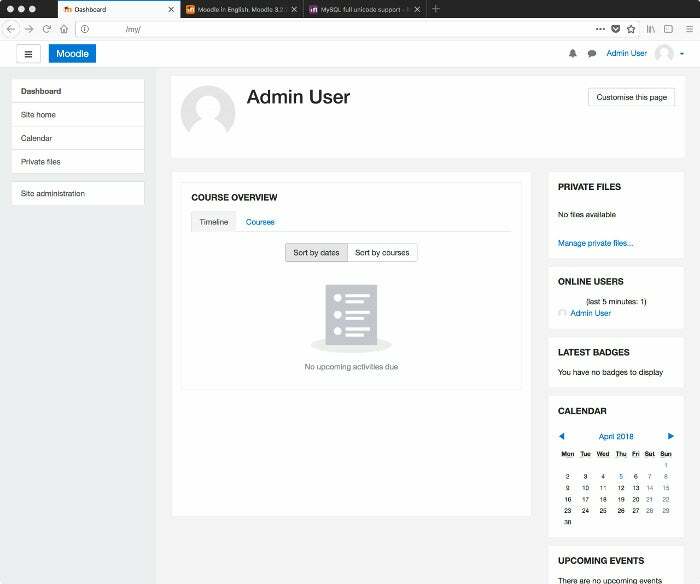 Complete the few remaining setup options—create an administrator account, your site name, and short site name—and you can even register your Moodle installation with https://moodle.net if you'd like. Congratulations! You'll finally arrive at your Moodle site. Moodle has a number of excellent resources, from video tutorials to online documentation, to help you start developing your server and placing course content up for others to learn and enjoy. Steve will be speaking at LinuxFest Northwest this year. See program highlights or register to attend. Steve Morris - Serves as the Director of Information Technology at Ambrose University in Calgary, Alberta, Canada. Cut his Linux teeth on Slackware, but spends most of his days with either Ubuntu or Fedora. Free time is spent running in an effort to complete that first half-marathon.